Apart from the logo, there is a lot more to the deal. As the official technology partner of FC Barcelona, Intel says it will enable the club to become one of the most technologically advanced football clubs in the world. None of us are fashion designers, but we are of the understanding that to make a logo stand out on a football team’s jersey, it should be placed somewhere on the front. 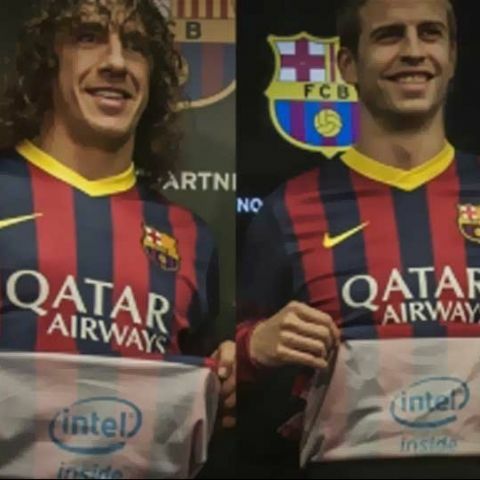 However, Intel seriously believes its own “Inside” theory, as proved by the latest sponsorship deal the chipmaker has signed with FC Barcelona. The general belief seems to be that players will show the logo when they score a goal, based on the habit footballers have of lifting the jerseys in celebration. The new jersey was unveiled today at FC Barcelona's training facilities by Intel's Chief Marketing Officer Deborah Conrad, FC Barcelona’s president Sandro Rosell and FC Barcelona stars Gerard Pique and Carles Puyol. The new jersey will be worn for the first time in the La Liga match against Villareal on Dec. 14. Stars such as Xavi, Iniesta and Neymar were also present at the event. However, that is not all for this deal. The partnership includes a lot of other aspects that tend to get hidden behind this, ummm...hidden logo! Intel will provide the latest hardware and technology to the students at the famous La Masia football academy to enable and foster a culture of creativity. Intel will also be supplying FC Barcelona players and coaches with the latest Intel-based 2 in 1 devices, while working with the club to improve its research, training and performance via the most up-to-date technology. The company will also start working with fans to improve and implement technology at the Camp Nou. FC Barcelona players show off the 2-in-1 Intel powered devices that were presented to them. "This is more than a sponsorship to Intel," said Deborah Conrad, Intel chief marketing officer. "The technology we are deploying and the programs we are working on together are designed to elevate FC Barcelona into one of the most technologically advanced soccer clubs in the world and to launch an ambitious slate of educational initiatives." "It is a huge satisfaction for FC Barcelona to be able to join forces and share the values of innovation and teamwork with a company of such worldwide prestige as Intel," said Rosell. "We are both trendsetters in our fields, and I am convinced the collaboration we are starting today will be very important. It will mean much more than a financial sponsorship." FC Barcelona have always been rather interested in unique sponsorship deals. The football giants has signed a sponsorship deal with UNICEF, involved Barcelona paying €1.5 million a year towards UNICEF projects around the world. This was a first of its kind sponsorship deal for any football club, and still remains one of the very few. The club, though, have fallen on hard times in recent years, at least financially. Current estimates have indicated debts of around €430 million, despite Barcelona’s success on the pitch.